If One Wants to be PWA’s Customer, What Does He Have to Do? Those who want to use PWA’s water may contact any of PWA branch across the country or download the application form from the website http://www.pwa.co.th/content/service/download/form and then can submit the application form including the required evidences at the PWA branch in the area where the water supply will be used. An identity card (ID card) or government official card or state enterprise employee card, including a certified photocopy of the card, of the person requesting for PWA’s water. A photocopy of the card is recommended for the sake of quickness and convenience. A photocopy of the house registration of a house requesting for water supply installation, and in which the name of the requester appears as its owner, or a photocopy of the document on requesting for the house number, or the document on a contract of house/building sale and purchase, or document on a contract of house/building rent (any one of them is accepted). In the case that the requester name does not appear in the registration of the house at which the water supply system will be installed, a photocopy of the registration of the requester’s current house has to be displayed as well. In the case that the party asking for an installation of PWA’s water supply system is a government agency, state enterprise and other organizations which have already registered and had a license, the heads of those government agencies or organizations or authorized persons shall sign in a request form for an installation of the water supply system and sign the contract with PWA for use of its water. In the case that the party asking for an installation of PWA’s water supply system is a limited company, public company, limited partnership, ordinary partnership, commercial bank, private school and other juristic persons, the manager or legal owner shall sign in a request form for an installation of the water supply system and sign the contract with PWA for use of its water. A requester of PWA’s water may write a mandating letter and give it to another person to act on his/her behalf, with another 2 people signing on that letter as witnesses and attaching stamp-duty on it in accordance with the law. The authorized person shall bring the evidences identified in items 1 and 2 of an authorizer to display at PWA branch when making a request to use PWA’s water. Is Water with Chorine Odor Dangerous Or Not ? Chlorine is used by PWA for disinfection in its water supply to obtain quality drinking water which is safe for the public. The water supply in some area has strong chlorine odor, particularly that which is close to a place of production/distribution. Customers should be confident that the amount of chlorine mixed in PWA’s water is of WHO’s standard. Meanwhile, the chlorine odor in the water indicates the safety of water distributed to the public’s homes, and so the water is without disease and safe to drink. If customers are not familiar with the odor of chlorine mixed in water, an easy way to solve this problem is to put the water in a clean container (the cover should be kept ajar on the container) and let it rest for a night and chlorine odor will all evaporate. The container must also be clean, which makes the water kept in it clean too and safe for consumption. What is PWA’s Potable Tap Water Project ? PWA’s water produced from its water treatment plants nationwide is of good quality and high standard and potable, and lives up to WHO’s criteria on the quality of water for consumption. To generate more public confidence, PWA, in collaboration with the Department of Health (DOH), has established a potable tap water project aimed at a strict control of the water production so that the water produced is clean and safe, encouraging people to drink it since the water is certified by DOH of its cleanness and safety. The declaration of the area of the potable tap water project is made for 10 places (PWA branches) a year to create confidence in people in the consumption of PWA’s tap water. The declaration of potable tap water helps reduce the public’s daily living expenses because they don’t have to buy bottled water, apart from decreasing the amount of garbage incurred by plastic bottles and upgrading the quality of life of regional people. In implementing the potable tap water project, DOH’s officials will monitor PWA’s water quality thoroughly from water samples collected from a treatment plant to the end of the distribution system, or from public places such as fresh markets, schools and government buildings for physical, chemical and bacterial analysis twice for one place The second-time analysis is made about one or two months away from the first one. If the water quality is found to live up to the standard in both analysis, the area is proclaimed as potable water areas, most of which their distribution mains have been rehabilitated or improved. After a proclamation, the quality of water in the area is still closely examined to ensure that it is good all the time. However, customers should steadily inspect the pipe, equipment and clear water tank in their premise to make sure that they are in good condition all the time too. This may be caused by the distribution area which has different level of hilly or flat one, or the water is used simultaneously, especially in the morning and evening, which makes the water pressure low and the water flow slowly. In case of low-pressure water, customers should report to PWA branch in their area. Consistently check pipe and tap in the premise. If they decay or become rusty, replace them with a new one. Don’t install a water pump directly from the pipe since if there is burst or leaked pipe, dirt will be drawn into the pipe. When a water filter is used, customers should clean it based on the time identified by the producer because a filter may be a place where germs are accumulated. Customers should continuously clean their clear water tank since there may be dirt mixed in it. What to Do If Tap Water Doesn’t Flow in Homes ? Inspect valves both in front of and behind the water meter to check whether they are turned on or not. Inquire their neighbors whether the water in their house flows or not. Inquire PWA branch in the area customers use its service. Every house should keep a spare container of no less than 500 – 1,000 liters for emergency use. Why Is the Water Fee Unusually High ? Unusually high water fee may stem from a leak within customers’ premise, for instance, pipe burst or leaked sanitary equipment, which makes the water meter run all the time. As a consequence, customers should constantly keep checking by turning off all taps to observe the meter’s functioning. If it still runs, this indicates that there is leaked pipe inside the premise. So call for a mechanic for a repair soon. In case customers do not always reside in the house, a valve behind the water meter should always be turned off. If there is leaked pipe in their premise, there will be no loss of water which will cause a higher water fee. There are numerous channels for water fee payment, which include the following. Through PWA’s agents at such service points as 7-Eleven, Tesco Lotus, “Pay at Post”, “Just Pay”, Jay Mart Pay Point, True Money True Express, “Pay Station” 108 shop. Through an ATM of Siam Commercial Bank throughout the country. Through the counter of Siam Commercial Bank. Through the counter of Krung Thai Bank. Through the counter of Thai Military Bank. Through the counter of Krung Sri Ayutthaya Bank. 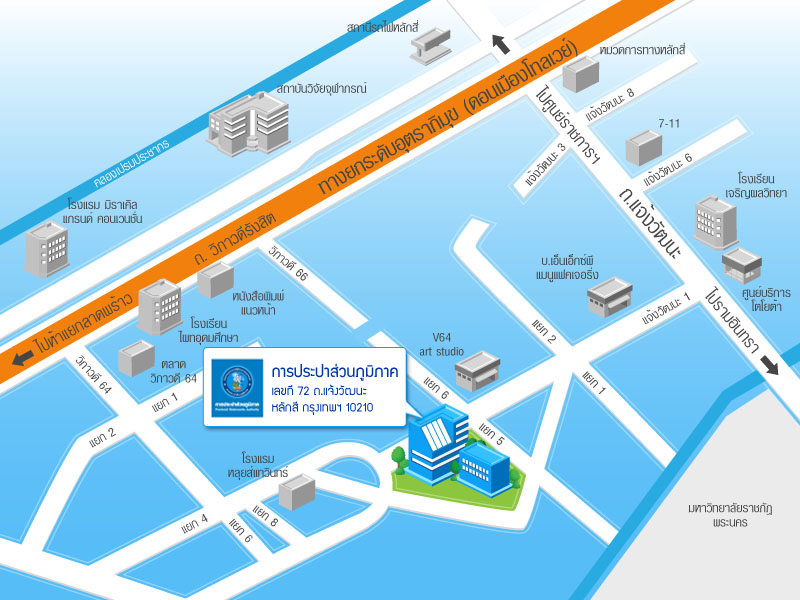 In the service area of PWA Rangsit branch – Pathum Thani branch, call at 0-2981-8945-50. 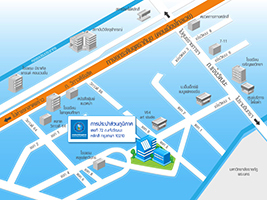 In the service area of PWA Om Noi, Sam Pran and Samut Sakhon branches, call at 0-2814-0061, 0-2814-0420. Where Can Customers File A Complaint on PWA’s Service? In case customers do not get convenience in PWA’s service or wish to express their opinions and give suggestions relating PWA’s services, they can do through the following methods. Inquire about the detail or notify the matter directly to PWA staff, manager or regional director taking charge of the area, or contact through the phone or at PWA branch. Send a letter expressing opinions or providing suggestions to the mailbox 67, Laksi, Bangkok 10210, for which PWA has arranged to receive public opinions in particular. In case customers find pipe burst, please report to PWA branch providing service to them so that correction may be immediately made, or inform via the phone number 1662. When customers call at the number 1662 to report on pipe burst, the operator may not be staff of PWA branch in the area where the burst occurs. Thus customers should identify the service area or the area where pipe burst is found in order to check which PWA branch is in charge of that area so that the operator will coordinate with the branch to solve the problem very soon. How to Make A Request for Cancellation of Use of Water Supply And Ask for Deposit Refund ? The following are evidences which have to be displayed when asking for a return of water usage guarantee fund. A water user’s photocopy of ID card or government official card or state enterprise employee card. A receipt of water usage guarantee fund (if any). A customer (water user) may provide for a mandating letter to another person to act on his/her behalf, with 2 people signing as witnesses and attaching stamp-duty as required by law. An authorized person has to bring evidences identified in the above items (1 – 3) including his/her own evidences to display. When the customer has displayed those evidences to PWA branch in the area and file a request for canceling the use of PWA’s water, the branch will check whether there is an amount of overdue water fee. If there is not, the customer will get back the water usage guarantee fund in full amount. In case there is an overdue fee, it will be deducted from the fund and the rest (if any) will be returned to the customer. Essential Practices for Use of PWA’s Water. A violation of water supply usage, for example, direct pipe connection without passing a water meter / water theft, including meter tampering, all of which is unlawful and equivalent to theft and damaging the properties of PWA, which is a government agency. Those who violate are subject to both a criminal and civil prosecution. In case of a damaged water meter or a need to move it to another place, customers will have to report to PWA branch as soon as possible so that the branch will have it fixed or moved away. If a defect or flaw is found, for instance, a pipe burst outside a water meter, please report the case to PWA branch for a correction. Customers should not install a water pump directly from the pipe but should let the water supply be stored in a tank or container first, and then pump it from the tank for use. An installation of a pump directly from the pipe may damage the pipe itself and the meter, apart from causing a trouble to other water users. Having a spare tank or well with a capacity of 500 – 1,000 liters in your home will ensure that you will have water to use all the time although there is a pipe burst outside your home. Customers must not absolutely fix, revise, modify or do anything on their meter and water gate (valve) or pipe outside their meter (premise). In the case the wire or any material which PWA has sealed on the water meter or valve becomes damaged or lost, including the meter, whether by intention or carelessness of any person, customers must report to PWA branch as soon as possible, not over 3 days at the latest. Customers have to pay the water fee, other service fees and damages immediately when PWA staff take a receipt or invoice to them to collect the money. Otherwise, they will have to make a payment at PWA branch within the time defined in a warning letter. If it is beyond the time defined and customers still do not pay, PWA will cancel the distribution of its water (cut off the meter). For a payment of any fee, customers must ask for a receipt, every time, from an official who takes their money, as an evidence. When there is a group of people contacting customers for an employment to modify or correct a water meter or other accessories, please notify PWA branch in the area immediately in order to preserve the interest and properties of the state. For the group that contacts customers and cite it is PWA staff, customers should check an introduction letter of PWA staff who makes an inspection of water meters, such as his PWA employee card, by taking a note of the card number, name and surname before allowing him to inspect the meter in order to prevent his allegation as being a PWA employee.